ENHANCE THE ENJOYMENT AND THE VALUE OF YOUR HOME. MAKING PROPERTY MANAGERS’ JOBS A LITTLE BIT EASIER. WE TAKE PRIDE IN THE BEAUTY AND LONGEVITY OF OUR BRICK WORK. TACKLE CHICAGO WINTERS WITH EFFICIENCY AND CONVENIENCE. Landscaping & Brick pavers for the greater Aurora, Naperville, IL area. At GoldLeaf, we have one goal - to create outdoor spaces that not only look beautiful but enhance the enjoyment and value of our customers’ properties. That’s what guides everything we do. From full-fledged design and installation projects to maintenance work, we strive every day to bring the absolute best results to your property. Because at GoldLeaf, we believe landscape design and build is a valuable life investment. Our design services help homeowners get the outdoor living spaces they’ve been dreaming of while simultaneously adding undeniable resell value to their homes. Our maintenance services help property managers to not only ensure that their properties continue to look stunning, but also free up their own time, allowing them to invest more of their energy into other critical responsibilities. Driveways and entryways for the front of your home. Livings spaces, patios, and outdoor kitchens in your backyard. And everything in between. 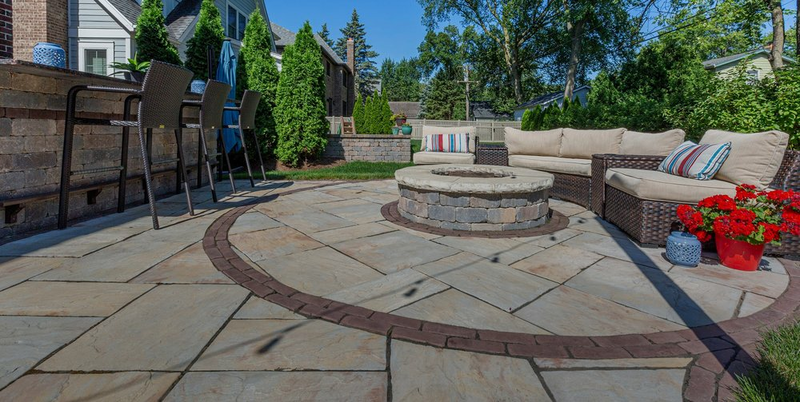 When imagining the luxuries of outdoor living, these are the first features you think of. And GoldLeaf should be the first ones you call to make them happen. We’re committed to helping property managers build, enhance, and maintain their landscaping – not only making things look great, but helping their facilities run smoothly. A lot can be said about what we do, from our process to our service relationships. But, sometimes, you’ve just got to see the final results for yourself. You don’t have to wait to have GoldLeaf Landscape improve your outdoor living spaces! Chicago winters are brutal and unpredictable. Working with GoldLeaf for your snow removal services not only ensures the safety of your patrons or residents but keeps you from unexpected inconveniences.